You thought I forgot about doing bowl projections this week, didn't you? • Midway through the 3rd quarter last week, one of the Capital One Bowl reps on-hand in the pressbox was handing out bowl info sheets to media folks, and said to me that it's looking like Michigan is heading to their bowl game (he almost kinda chuckled when he said it, which I thought was weird). Mind you, this was when Michigan was deadlocked with Northwestern, and Penn State/Nebraska had yet to kickoff. I think they'd be tickled pink to have Michigan in their bowl game. Not to be outdone, but the Rose Bowl reps' black blazers with the Rose Bowl insignia stitched into the side was top-notch, first-class all the way. They were NOT handing out info sheets. I think the media knows were Pasadena is and how nice it is in January. 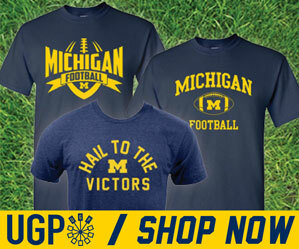 Believe it or not, Michigan is still alive for the Rose Bowl, or even an at-large BCS bid. They're ranked 21st in the latest BCS rankings. And while it seems very unlikely, it's still plausible that if Michigan wins out, and they get a lot of help from other conferences, it could happen. To receive an 'at-large' bid, you must be ranked in the top-14 of the BCS rankings and have at minimum 9 wins. I'm not saying it's likely, but it's possible. • I don't think the league is going to fill all 8 of it's bowl tie-ins. Indiana and Purdue are both 4-6, and I think both of them each wins and loses one more game. Purdue should beat Illinois this week in Champaign. That means they need to win at home in the finale against Indiana for the Old Oaken Bucket. Indiana travels to Happy Valley which could actually be a very interesting matchup this weekend. A week ago, Indiana was on the inside track to the Rose Bowl. This week, they're not projected to be bowl-eligible. That's harsh. • Iowa's loss to Purdue all but sealed their fate for a bowl-less year. They have Michigan on the road this week and Nebraska at home next Friday. They need to win both. They will not. • Michigan State sits at 5-5, needing only a win over Northwestern at home this week, or Minnesota on the road next week to ensure a bowl bid. I think the winner of this week's game gets the Gator Bowl, while the loser heads to the B-Dubs Bowl. I bet Gator Bowl reps are rooting for Michigan State.